Look at this poster. The guy on the left is depicted as a musclebound thug covered in tattoos with cauliflower ears engaging in a blood sport. Maybe we should be grateful there is such a thing as MMA or this character would be in prison or the nuthouse, right? Now observe the gentleman on the right. He's bowing in respect, an obvious by-product of self-mastery developed from a long time of training in an honored fighting tradition that ultimately has lofty, even peaceful aims. He is a disciple (and perhaps a teacher) of Budo — the martial arts. 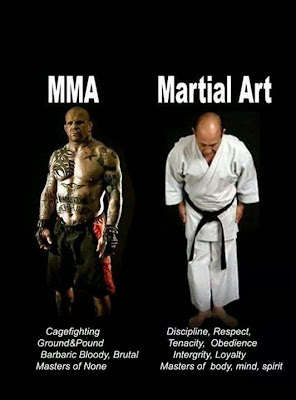 Basically what this image is saying is that Traditional Martial Arts (TMA) are civilized and cultivate good qualities in its adherents while MMA is legalized headbashing that provides little more than a buglight for violent whackjobs. This just reinforces some unfair stereotypes, especially to laypeople. There are good and bad people in all walks of life. Don't be so fast to judge a book by its cover. 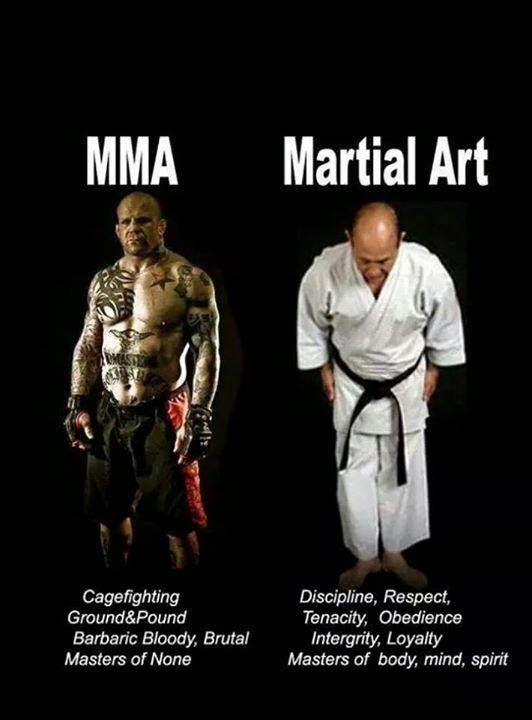 It's true that MMA has no official philosophy or written tenets of life principles like those found in TMA. But MMA doesn't automatically produce a crop of bad guys anymore than TMA can unconditionally change otherwise unsavory types into good citizens. As karate master Yasuhiro Konishi once said, "Karate aims to build character, improve human behavior, and cultivate modesty; it does not, however, guarantee it."